Pagham get lively draw at East Preston. 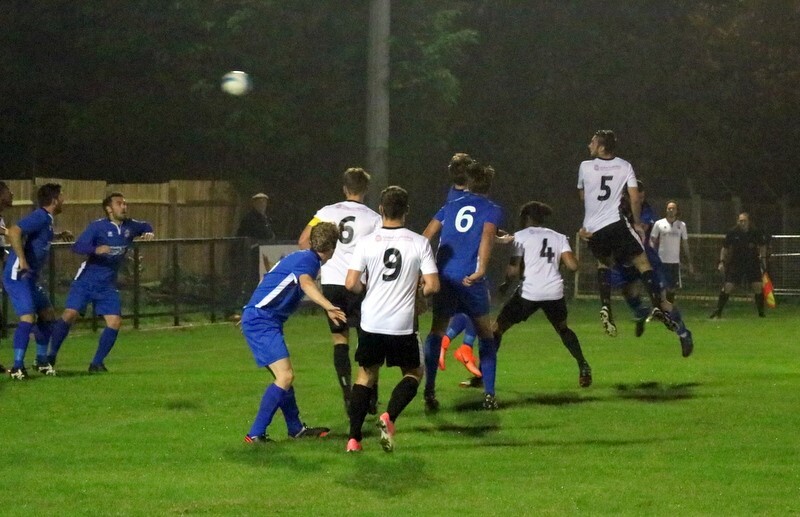 Pagham gave their best performance for a week or so at the Lashmar on Tuesday night, but didn’t quite do enough to take all three points. The first effort of the game saw Andy Chick hit a longshot just over the bar following a cross by Ryan Cox as Pagham started the game on the front foot. But it wasn’t long before East Preston got in on the act as debutant Lions keeper Kieran Magee had to make a smart low save before EP’s Matt Searle headed a good chance over. Returning Pagham striker Dan Simmonds tried his luck with a 25-yard chip that the keeper just managed to flip over the bar soon after, before the Lions hit the front. Lloyd Rowlatt was blatantly pushed over from behind in the box and Simmonds stepped up to bury the ensuing penalty in the 19th minute. Pagham almost increased their lead soon after when Ryan Cox fed Simmonds, but his shot was tipped over by EP keeper Cook. Pagham were by now well on top and a free-kick for a foul on Alex Ansa-McIntyre almost doubled the lead but Daryl Wollers header was straight into the keeper’s hands in the 29th minute. Ansa-McIntyre then almost got on the end of a long through ball from Rowlatt, but just failed to connect as Cook raced off his line to claim it. It was not all Pagham though as Ryan Davidson had to hack the ball off his own line following a fine run by East Preston’s Luke Brodie. But it was the Lions who finished the half on top as Simmonds had another shot well saved by keeper Cook just before the whistle blew. A dubious free-kick awarded to East Preston a minute into the second period led to Lions keeper Magee making a superb save low to his left, before Daryl Wollers was booked for a poor challenge on 50 minutes. East Preston were well on top now, with the Lions only chance coming on the break when Lloyd Rowlatt hit a shot that was only parried by the keeper, who managed to grab the ball before any inrushing Pagham forward could get on the end of it. But the ball was soon back up the other end and Magee had to make another good save before George Bingham was probably lucky to only see yellow for a bad foul on the half-way line. As the game now switched to an end to end scrap, Simmonds had a lovely shot flash a yard wide before disaster happened at the other end as Hayden Hunter burst through the defence to bury his shot passed Magee to tie the scores in the 63rd minute. Pagham now took the game over completely in a bid to win the three points, but whatever they tried just wouldn’t come off. George Bingham hit a shot just passed the post on 70 minutes before Terrell Lewis came on to try his luck in place of Ansa-McIntyre. With Andy Chick and Lloyd Rowlatt now completely dominating the midfield it seemed like it would not be long before the Lions would grab a winner. On came Joe Ashmore for Jamie Horncastle and Joe Booker as an extra forward for Andy Chick as Pagham kept pushing forward, but yet another Dan Simmonds chip just didn’t have enough on the ball to lift it over Cook. To prove they weren’t quite out of it EP’s Lucas Franzen-Jones missed probably the best chance of the game when he hit a shot from less than ten yards past the post on 85 minutes on a rare EP break. But still Pagham kept pushing forward and Simmonds agonisingly watched his cross-shot slide past the post as the game entered added on time before the referee blew his whistle to put an end to the contest. Pagham’s team was: Kieran Magee, George Bingham, Johan Van Driel, Ryan Davidson, Daryl Wollers, Jamie Horncastle (Joe Booker), Alex Ansa-McIntyre (Tyrell Lewis), Andy Chick (Joe Ashmore), Dan Simmonds, Lloyd Rowlatt, Ryan Cox.